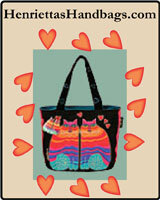 Here are a few bag sewing tips that I have learned over the years! If you have any additional ideas that you think will help with sewing that new handbag, just send me an e-mail with your idea and I will include your suggestion along with your first name. Be forgiving of your skills - no one starts off as an expert! Seam rippers are not indications of failure - there is no shame in having to rip a seam apart. Sewing is fun! Never forget that you are making that handcrafted handbag because you want to, not because you have to. You are not in competition with anyone - this is YOUR bag, not someone else's who is going to judge your skill level. If you are not happy with the way your bag turned out, don't be discouraged to try again - it will go even faster the second time you make your purse and you can correct your mistakes. Know yourself well enough to realize if something about your new bag bothers you. An example is if you finish your project and everyone says it looks great but everytime you look at your bag, you see a flaw such as the flap off by 1/2 inch, etc. If your personality is such that you can't take pleasure in your accomplishment because you always see that flaw, then take the bag apart and correct the error, make a new bag with the problem corrected, or give the bag to someone who appreciates it and doesn't care (or even see!) the flaw. 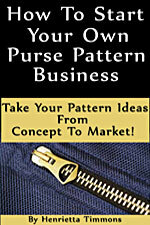 Read all directions for a pattern through first! 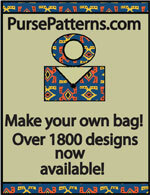 Back when I began sewing handbags, I wanted to jump straight in with sewing because I was anxious to have my new purse! I have found over the years that it definitely pays to read through the instructions - that way if there is something that confuses you, there is a better chance of understanding if you know what comes before and after the confusing instruction. Be kind to yourself - just because a pattern says it can be made in 2 hours doesn't mean you are inept if it takes you 3 hours!